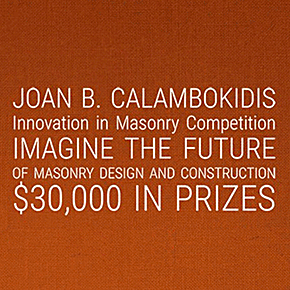 For the Joan B. Calambokidis Innovation in Masonry Competition solutions should explore the implementation of innovative masonry construction technologies and focus on building envelope performance with respect to constructability, energy, structure, and aesthetic considerations. All designs must incorporate one or more of the following materials: brick, concrete block, tile, marble, terrazzo, stone, or plaster. Participants are also highly encouraged to use BIM-M tools like the Masonry Unit Database and other plugins found at bimformasonry.org.